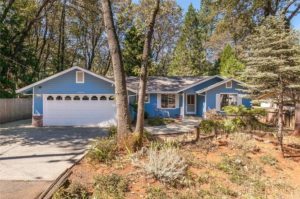 Well-maintained home nestled among the trees in the Paradise Pines community of Magalia, California. Home offers newer water heater, updated master bathroom, stainless steel appliances, and a security system. Not only does this home have a two car garage, but boast an attached covered carport as well as RV parking with electrical hook-up and plenty of room for more toy storage. Recently a new fence and gate has been installed along the east side of the property. Located within a POA offering numerous amenities, including a club house, swimming pool, tennis courts, and children’s play area. Being in lower Magalia the post office, shopping and dining are close. It’s an easy drive to the “on-the-Ridge” community of Paradise, with its active shopping districts, restaurants and cafes, and multiple services. A few minutes drive will down “The Skyway” will take you to Chico.